Anton Ivancic has lived football (soccer) for more than 40 years. Born in Croatia, he grew up in New Zealand and played for underage representative teams before graduating to National and Central Leagues. His big break came in 1984 when he moved to Australia to play for Sydney Croatia (now called Sydney United). Sadly, fate was not kind to Anton as his international clearance went wrong and he never played a game with the Australian National Soccer League club – the same club that produced Socceroo legends Graham Arnold, Mark Bosnich, Jason Čulina, Craig Foster, Tony Popović, Robbie Slater, Ned Zelic and Tim Cahill. In 1986, 25 year old Anton tried out with Sydney Olympic, but work commitments prevented a permanent contract; the opportunity to play at the elite level in Australia had passed. Anton played as a part-timer in various Sydney league competitions for the next sixteen years. In 2003, Anton commenced his coaching career. He has gained a range of junior and senior coaching licenses and has completed a variety of head and assistant coach assignments. 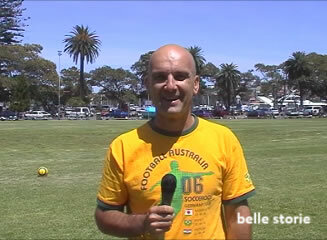 In 2006 he quit his corporate job and took off to Germany to see the Socceroos amazing performance in the World Cup. On return, unemployed Anton began his quest to coach at the elite level with an A-League club. six to ten begins upon Anton’s return from Germany and continues through to the 2010 World Cup in South Africa. Who knows what lies ahead, but there will be passion, courage and determination. If you’d like to be notified when an additional chapter is added to the six to ten story board, please join the email mailing list by clicking on the mail list football below. You can also get more regular up-dates via Anton’s personal blog – click on the blog football below.